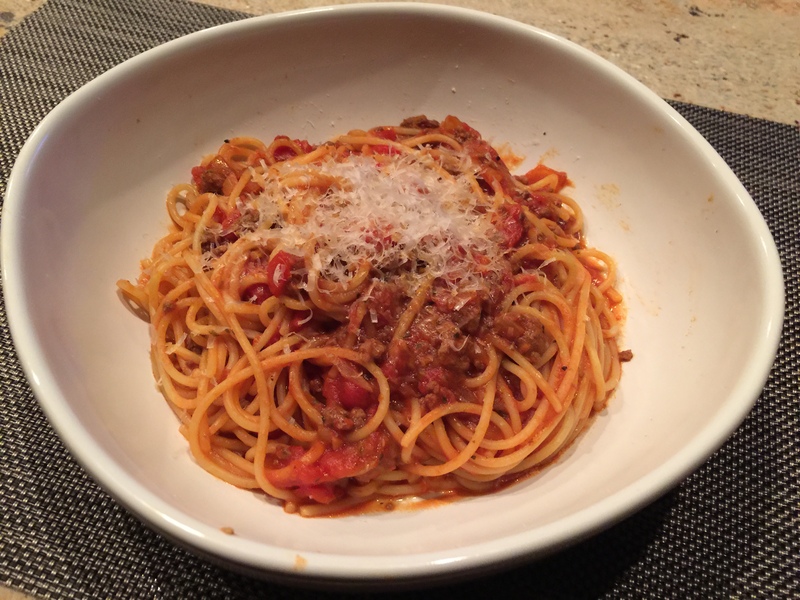 Last night we opened a jar of Bertolli tomato sauce and cooked up some thick spaghetti. I usually make my own sauces but we got a late start on supper so it was the jar for us. I am not ashamed because I do not leave the sauce the way it comes out of the jar. I add onions and garlic, oregano, and maybe a hint of red wine and red wine vinegar to tone the sweetness down. I am liking this thick spaghetti. It has a good chew to it. As sometimes happens I get so excited when we are having pasta that I forget to take a picture. So here is an old pasta picture. This entry was posted in Italian, Pasta, Vegetables, Vegetarian and tagged Spaghetti, tomato sauce. Bookmark the permalink.